The weather is getting warmer so I’ve been experimenting with some simple ideas that will minimize layers and keep your head from overheating in the sun. I love wearing tichels in the summer because they keep the hair off of your face/neck and prevent your scalp from sunburning. Easy and colourful! 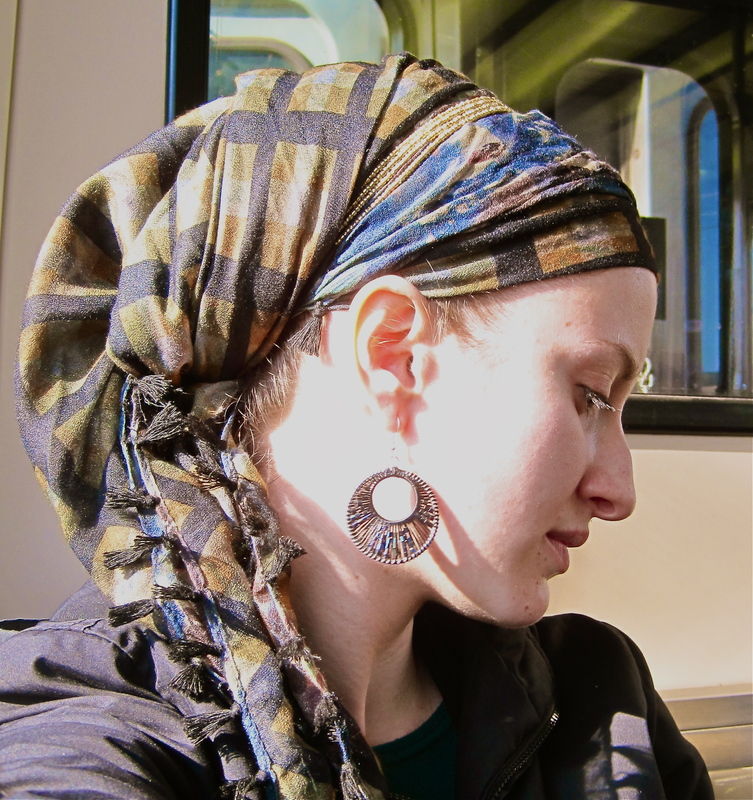 Just tie an Israeli scarf underneath another square scarf, and tie into the bun style shown in the “beautiful basics” video. Twist both tails around the bun. I found this neat scarf that has a different pattern on the front and the back! If you can’t find one like this, do not fret… this tie works just as well without it. Use a large square scarf and tie a basic triangle tie (first tie in “beautiful basics”). Then take the tails and wrap them over the top of your head, tucking the ends in. If you have a scarf with different sides, wrap it so the opposite side is showing. Then add a pretty headband and you’re done! For this one, make a high ponytail with your hair, take two contrasting Israeli tichels and tie them with the second tie from the “beautiful basics video” aka tucking the middle ends in to make a bun. Then take a ribbon and tie it around the bun, leaving all the ends hanging. 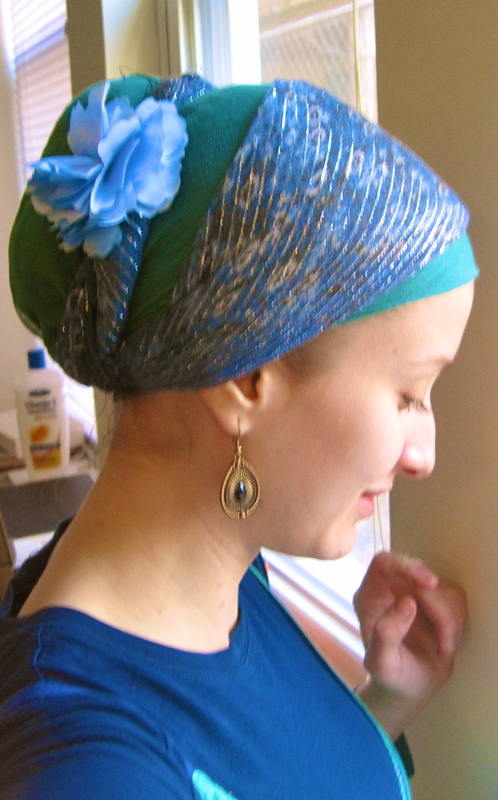 This is a “royal twist” using a very long, lightweight, two-tone scarf… I wore this for Shabbat! 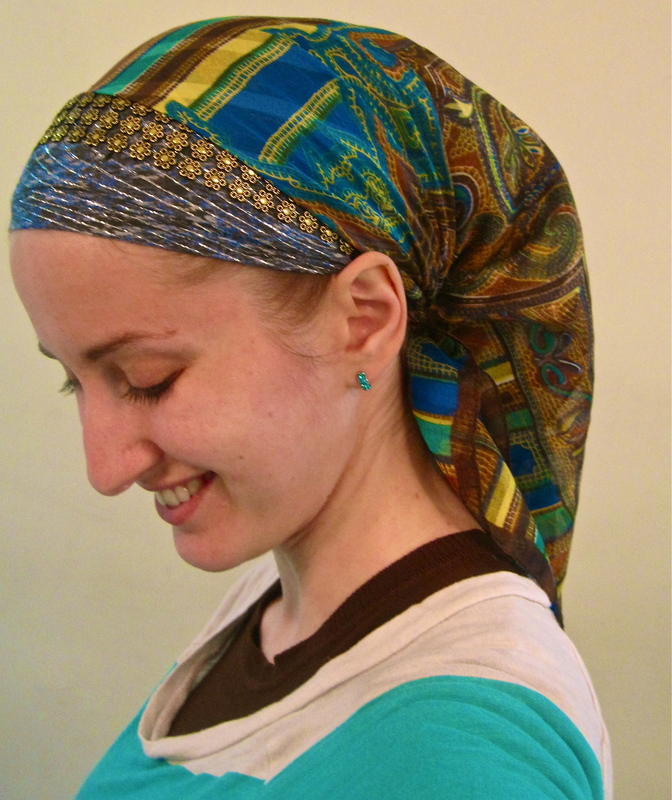 This is an easy way to look fancy without having too many layers on your head! 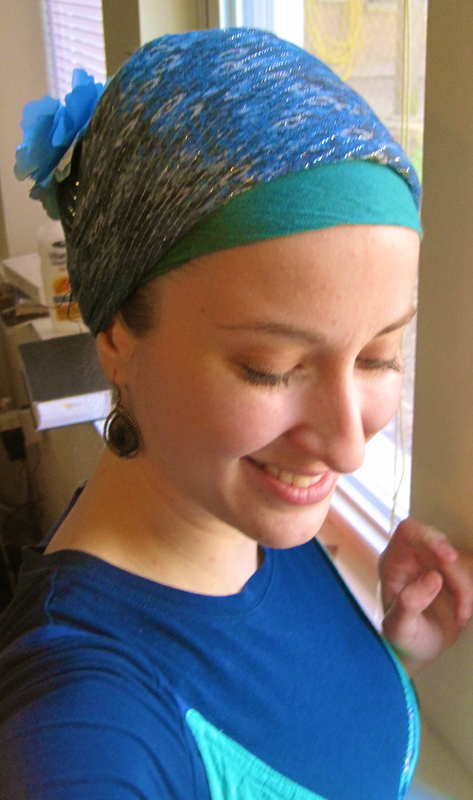 For this tie, take an Israeli tichel and tie it in a bun (third tie in the “beautiful basics” video). Slip on a headband. Now tie a square, lightweight scarf over it, letting the ends hang. 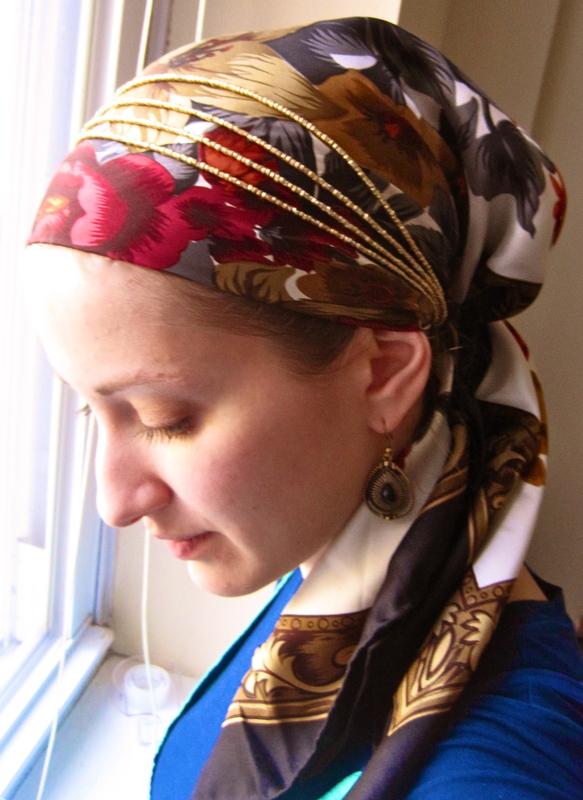 This is a “regal wrap with hanging tails” except using only one long, very lightweight scarf. Add a pretty hairpin or brooch to keep everything together! Silk scarves are amazing for the summer. They’re so light and elegant without requiring any work from you! For this one I simply tied the square silk scarf in a triangle, tucking the middle end in. Then I added a beaded headband. Since silk scarves can slip quite easily, make sure you either clip it in with bobby pins, or use a “grip comfort band”, which I mentioned above. Here is a pretty “double wrap” with a flower pinned in. I hope you are all enjoying the beautiful weather wherever you are! All of your styles are beautiful! When you say, “tie a square scarf,” (like in the first example – my favorite!) are you assuming it is folded in a triangle first? Yes you are totally right! Thank you for pointing that out. Hi Andrea could you give me the measurements for the square scarf please. When I look for square scarfs they seem to be a bit on the small side. Thanks.. love all your videos wonderful ideas, very beautiful. Keep the ideas coming. Hi Natashia! I’m curious as to why exactly people are telling you that. 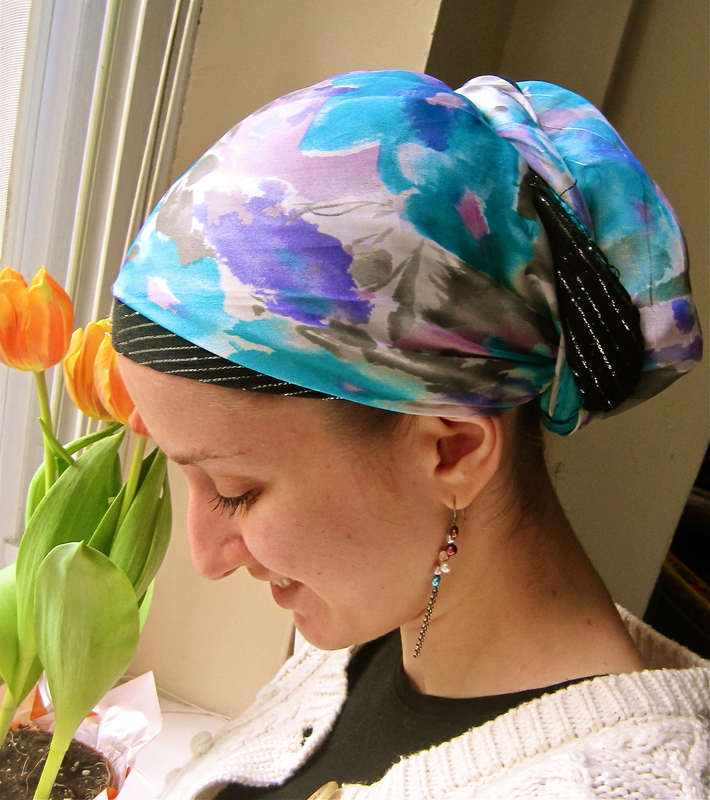 Try adjusting where your tichel hits on your hair… many women show a bit of their hair (it’s halachically fine) for this reason. 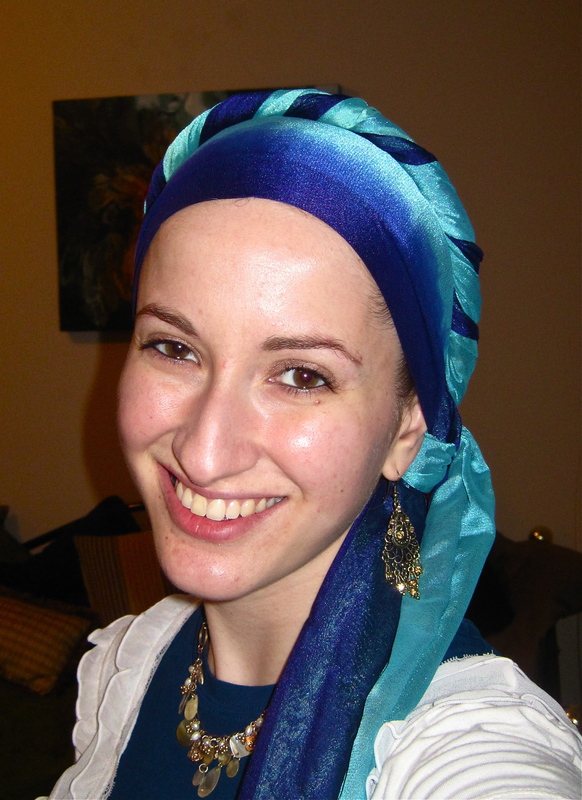 Experiment with covering/uncovering your ears and tying you tichel higher and lower to frame your face differently. 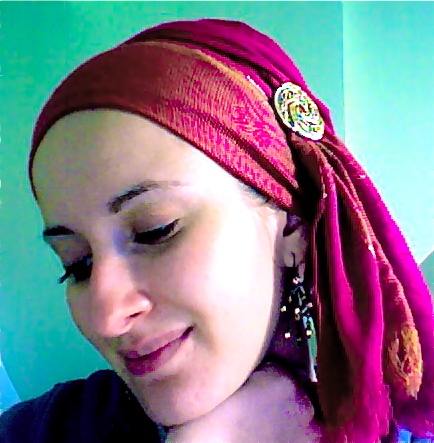 Let me know how it is going and welcome to the world of tichel tying! hi ! when was the first time you started wearing it ? Donnie, thank you so much for writing. I’m realizing that there are so many women that cover their hair for various reasons, and I’m so happy you’re feeling beautiful again! In terms of your question, which video are you referring to? 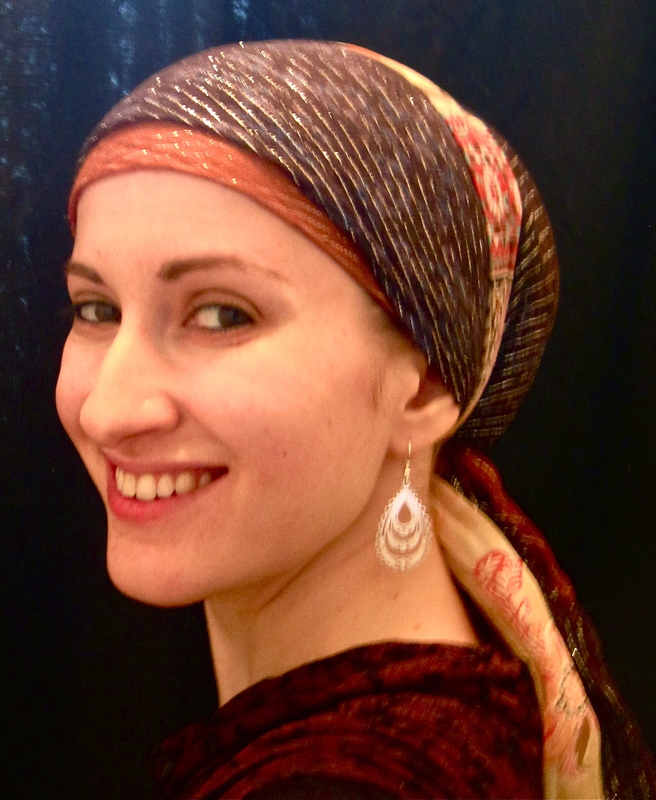 If you’re asking about this post, this scarf is just a super simple one from Israel… you can get them quite easily on ebay. Let me know if you want me to help you locate ones like this. Are you using a volumizer for your warmer weather wraps?